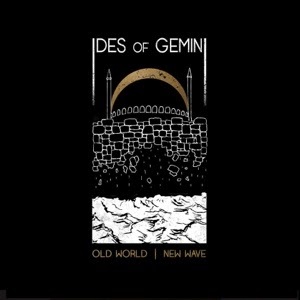 Interior Ministry has just released a limited edition cassette run of this brilliant second LP, from beloved occult-clad doom rock trio, Ides of Gemini. With "Old World New Wave" the band carve a very dream-like and certainly more driving sound than on their previous "Constantinople" LP. The band really seems to come into their own here, the songwriting sounds a bit more refined, confident, waving their wand over a much bigger canvas this time around. Sera Timms' voice is rich and commanding, atmospheric but not too overbearing. There's an underlying ache in her voice that trickles right down into her crawling bass lines, creating a dark and meditative vibe that is uneasy, but still quite soothing. Drummer Kelly Johnston-Gibson also lends her own lush voice to the songs, filling out the mix with operatic, chanted harmonies. The trio seem to effortlessly create a slow burning and mysterious vibe, and although vocals play a big role here, the bulk of this material relies heavily on the slithery, minimalist beauty of guitarist Jason Bennett. The riffs are fairly heavy but not in typical doom metal fashion. They're tasteful and on point, almost completely free of unnecessary effects, and never will you hear a flashy solo. All of these contrasting elements are tightly woven together by Gibson's minimal, heavy-handed drumming. She hypnotically pounds away with confidence, almost tribalistic at times, hanging just within a steady marching pace. Her style is so appropriately straight forward and brooding, which is a vibe that carries heavily throughout this entire record. Highly recommended. Edition of 100, pro dubbed tapes. Get one from idesofgemini.com now.